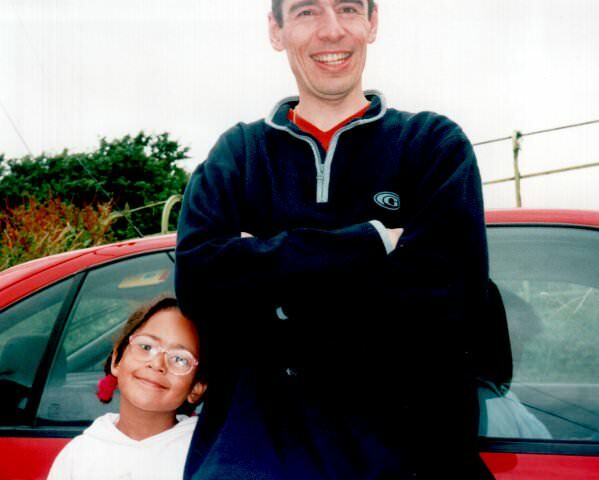 This is the travelog of Michelle and David during our family holiday to Wales. One day of our holiday was spent visiting Tremeirchion village, home to the mansion - Brynbella - that Hester Thrale built, as well as her final resting place and home to her ancestors, the Salusbury's. The travelog was written every evening using the cool Palm Vx and the incredible Palm portable keyboard. Well we made it at last. We are at Croft Farm and Celtic Cottage near Cardigan in mid-Wales. We got lost but eventually arrived. The children were extraordinarily well behaved. When we arrived the girls were very excited about the animals and all the things that they were going to do. They both keep calling the owner "the farmer". Anyway we had a bite to eat, put the girls to bed and are ready to collapse into bed. Tomorrow should be a gentle day, a lie-in, some exploring in the local area and a swim in the pool, followed by a trip to a Tesco supermarket for provisions. The Stable Cottage must be OK - Michelle hasn't fretted about it being "nasty". I think that we will have a relaxing and enjoyable time here in Wales. I can hardly keep my eyes open. I'm off to drink my hot chocolate and then sleep. A late start to the day's journey. 4pm to be precise. Looking forward to Wales. Made a couple of stops at Reading and then about 20 miles over the Welsh border at Sainsburys. Tired after arriving at Croft Farm at 10pm, after getting lost. The 'Stable' cottage is compact and pleasant. My head is pounding, my body is aching. The artificial pillows on the bed aren't what I am used to. After two paracetamols and another couple of hours sleep, I wake up properly. Natasha is crying because she has spilt oil on the carpet and was told off. We all have a leisurely morning - at least what is left of it. We finish unpacking and organising ourselves. It couldn't last, the girls are getting irritable. They really want to go out. After a trip to Tescos supermarket we drove round Cardigan - a winding seaside town. There was virtually no-one around. We saw a sign to Mwnt, Michelle said she read it was nice, so we drove there. We found a really isolated gem. Cliffs, a beach and a 14th century whitewashed church, all within a tiny village. Well worth exploring - but that will have to wait for another day, as we needed to get back to do a BBQ. I got the BBQ going after finding some old wood and hay. It was quite an ordeal to get it going - I wish I'd have bought the barbecue lighter fluid now! The BBQ was a great success. We went to see the ponies, rabbits and sheep. We couldn't touch the sheep - Foot and Mouth disease - restrictions. The owner has a ginger tom cat inevitably called Ginger. The girls are forever looking for it to stroke it. Elise is a bit wary of the cat and the ponies, I don't blame her! They also met a young boy called Sam about the same age as Elise. Early start for me with Ethan. Gorgeous day. The cottage has been awarded the 'Michelle seal of approval' for cleanliness. The only remnants of its former use are a few cobwebs. We really are among the rolling hills up here in amongst the trees and hedgerows scattered like mushrooms on the ground. We went to Tesco supermarket (made enquires about the farmer's market & fish fayre.) The locals appear to be friendly. I've not met any impoliteness towards the English or me as a black person. We drove into Mwnt today. I've never seen roads like it. One lane wide. A beach cove nestled below cliffs. We were there for 10 minutes. <a href="david_thrale>David cooked BBQ which the girls enjoyed. Too late to use the swimming pool. Ethan will be on baby rice this week! Elise and Ethan joined us in bed as usual last night. Unusually so did Natasha who had what sounded like an awful nightmare, something about an orange man and Mummy not saving her. In bed I barely had anywhere to put my legs it was so crowded, so after some perseverance I gave up and decamped into the vacated bunk bed. Didn't go anywhere, the girls watched a film inexplicably broadcast on Welsh TV in July about twin girls on a Christmas adventure. We went swimming, had dinner - gripping stuff! All in all a chill-out day. The weather forecast for tomorrow is rain and gales, so we'll try and find a day out we can do that won't be too affected by the weather. Weather not as warm as yesterday, but at least it didn't rain. Got up at 8.30 a.m. got breakfast for the girls and I and went back to bed with a headache. Had lunch, and Ethan had his first teaspoon of watery baby rice. We all went swimming. Ethan came too. He wore his 'little Swimmers' nappy and arm bands. He was not amused. Girls really enjoyed the usual splashing and I got to practise the fruits of my two years of swimming lessons. We ate ready-made Indian food for dinner. Took the children to play outside, on the swings and to see the animals. Even though this part of Britain has not been badly affected by foot-and-mouth disease you still have to disinfect your soles. Elise had a nose bleed whilst playing with Natasha. Rose earlier today, but still at a leisurely 9.30. We drove the short distance to Cilgerran Castle and enjoyed a short exploration of the castle. Rather strangely to gain access to the castle we were given a key to the gate and asked to lock it behind us. We then drove to Newcastle Emlyn. We past through the village of Cenarth. We did not stop to see the waterfalls because it was raining. Our plan of doing this on the way back was foiled by even heavier rain. In Newcastle Emlyn we explored the castle ruins, which were free but disappointing compared to Cilgerran. We enjoyed a homely meal and did our best to enjoy a stroll through the town. I did take a fancy to a 6 bedroom mansion in three acres of grounds, for not much more than a four bedroom house where I live now. Our stroll through Newcastle Emlyn was also curtailed by heavy rain. Got a little lost on the way back. My plan to find out about Thrale history by visiting Denbigh in North Wales will have to wait another day as the weather forecast for tomorrow is no better, more rain and flooding forecast. We left Celtic Cottages at 12.30. Visited Cilgerran Castle. The girls enjoyed being "Queens of the castle". The staircases, moat & windows still intact. Most of it was in ruins. Call me a philistine but I wasn't in particularly impressed. We had lunch in Pat's Pantry at 2 star 'greasy spoon' in Newcastle Emlyn. We drove through Cenarth where they had an idyllic mini waterfall and people appeared to be fishing. Flicked though some flyers from tourist board and have got plans for tomorrow but we really have to see what the weather holds in store. We went to the Gwili Steam Railway in Carmarthen. The journey took longer than expected due to a road closure diversion and getting stuck behind a lorry. We arrived to the railway at the very last minute. It was a pretty short journey in tatty old BR carriages, followed by an even shorter trip on a miniature railway. Having said that we enjoyed ourselves as did the girls. The railway is run by friendly enthusiasts. We met a friendly elderly Welsh couple who had taken their grandson to the railway. They told us that they were not Welsh speakers but that their grandson was being taught Welsh in his crèche. We drove the short distance into Carmarthen with the aim of getting a meal and perhaps walking round the town centre. The embarrassing fact was that we could not find anywhere to eat with children at 6pm except fish and chip type places. There were some hotel bars and pubs open that sold food but all were unsuitable for children. Incredibly we ended up in Tescos coffee shop and the girls had sausage and chips. There were only two other meals on the menu, scampi and chips or baked potato with various toppings. Ethan isn't getting as much attention as he deserves, as he is mostly just sleeping through our outings and the inevitable travelling. It is now a few hours later and we are back at the cottage and have topped ourselves up from the 'fridge. I am still totally gob-smacked that a large Welsh town should be almost devoid of places that a young family can eat out at, especially if you fancy something that isn't fried. Tomorrow we are going to get up early and drive about 110 miles to Tremeirchion, to see the birth place of my ancestor Hester Lynch Thrale, née Salusbury. Early start for the drive to the village of Tremeirchion and Graig the ancestral home of Hester Thrale. I estimate that it is about 120 miles away from where we are staying near Cardigan and will take about three hours to get there. The journey actually took about five hours. I had no idea what to expect. I knew that I was looking for the Church at which Hester Thrale was buried. Gabriel Piozzi may also have been buried there as well. There was also Brynbella, the home that Hester and Gabriel built - is it still there? What else? What about Hester's wood that she wrote about? I was worried that we would arrive after a five hour drive having made no prior attempt to contact anyone in Tremeirchion village first, that we would either not find the places or that the church and village would be locked and I would come away little the wiser. We arrived in the late afternoon, around 3.20. We saw a large building on the drive up, and passed a small building with a cross on it. I took a few photos and tried the door, it was locked. I walked round the building with the children and saw nothing of interest. I saw a lady enter one of the few nearby houses arrive with some shopping. I asked her if she knew how I could get in the church or if she knew about Brynbella. She kindly rang someone and then sent me to a house next to the church. She also suggested that we walk the public footpath at the rear of Brynbella to get the photos I wanted. I tried the house with no luck. I then took to the footpath and discovered that Brynbella was not at all how I had imagined it based on the little I had previously discovered about it. I imagined a larger than normal country cottage near a stream, possibly now showing signs of age. 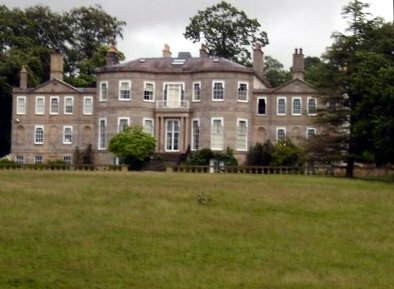 The distant view I had from the footpath was of a country mansion in fine condition overlooking grounds of substantial size. I got as close as I felt comfortable with (about 200 metres - I'd make an awful burglar!) and took a few photos. I went back, as suggested, to the house where I met the villager with her shopping. 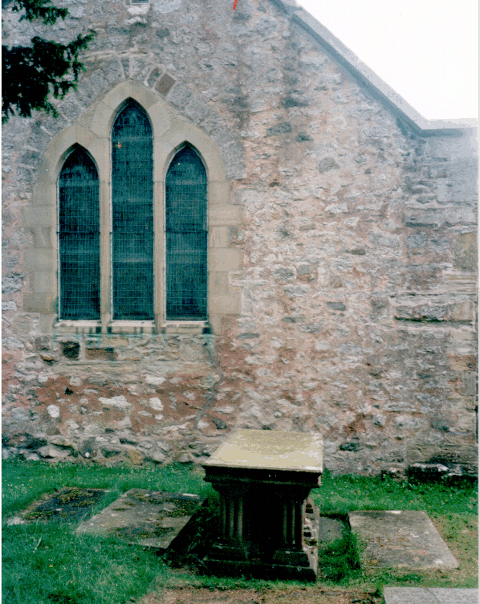 God bless her kindness, she had telephoned a friend in the village who pointed out that if was interested in Mrs Thrale-Piozzi that her remains lay in Tremeirchion Church and that the building I had previously found was the Welsh Chapel. She had tried to ring the owners of Brynbella without success and also tried to ring their gardener, also with no success. I was worried that my fears of getting nowhere would materialise. She was on her way to pick up her children from the village school and suggested I go with her to meet Sheila. A couple of minutes later we pulled up outside the school next to Tremeirchion Church. I was introduced to Sheila, who knew about Hester Thrale. They both told me about the event last year called Tremeirchion 2000 which was a celebration of the village in which photographs and old artefacts about the village's history were displayed. There was a lot about Hester Thrale. Sheila unlocked the Church and showed us a modern looking plaque erected in Hester's memory by Orlando Butler Fellowes, grandson of Hester's friend Sir James Fellowes and others from Bristol about 100 years after Hester's death. 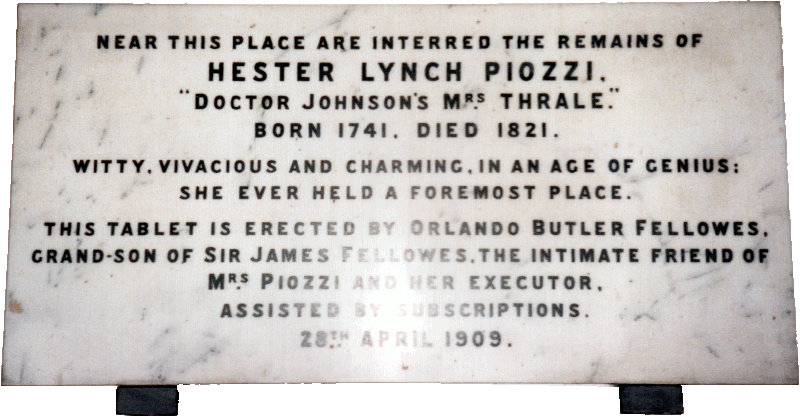 NEAR THIS PLACE ARE INTERRED THE REMAINS OFHESTER LYNCH PIOZZI. Sheila showed us where it is thought that Hester is buried underneath part of the current church building. She also showed us outside to a monument to Hester and her adopted son Sir John Salusbury Piozzi Salusbury. I looked at many gravestones - not all - and found no trace of a monument to Gabriel Piozzi. Sheila said that apparently Samuel Johnson did not go down well with locals as he was rude about their little village church. She said that they had about a visitor a month asking about Hester and that quite a few were Americans. She seemed surprised to meet me - someone actually called Thrale. Apparently the BBC had visited earlier in the year and done some filming about Hester for a forthcoming Arena TV programme that is due to be broadcast in September 2001. 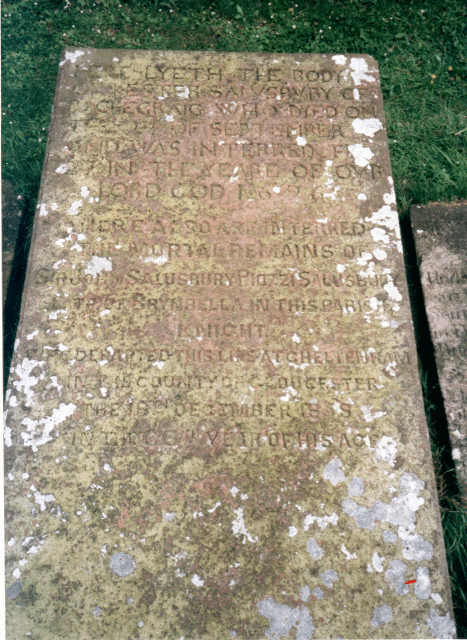 After Sheila left, I took some photos of the church and Hester's monument and transcribed the inscription, which is becoming hard to read and to get it all I had to do some minor scraping of lichens to trace out some letters with my fingers. Then we went to Brynbella which had two main imposing entrances. Both have large gates with coach houses. I got no answer using the entry telecom on both gates. We drove in. There was a very impressive tree-lined driveway of at least 200 metres length, laid with new looking cobbles. We passed a tree-hidden whitewashed house in the grounds. About halfway down we saw the stable yard - redbrick stable buildings on three sides. Now fully refurbished and converted to modern use, not for horses. A man was pottering about in the yard and saw us. I stopped and spoke to him. He said that no-one was in and allowed us to approach the front of the house to take a photo. We drove the rest of the way down the long driveway. At the end was a circular gravelled areas with a pretty grassed centre. This stood in front of the house. I was gob-smacked. Hester's "little place" was a very impressive mansion to which mere mortals like I could never aspire no matter how well my career develops. I stayed in the car and took a few quick furtive photos. I felt strangely uncomfortable and out of place despite getting consent first. On the way out back up the driveway we stopped to photograph the stable buildings. By now the chap we saw gave us a strange look. Time to depart before we give him the false impression that we are up to no good! 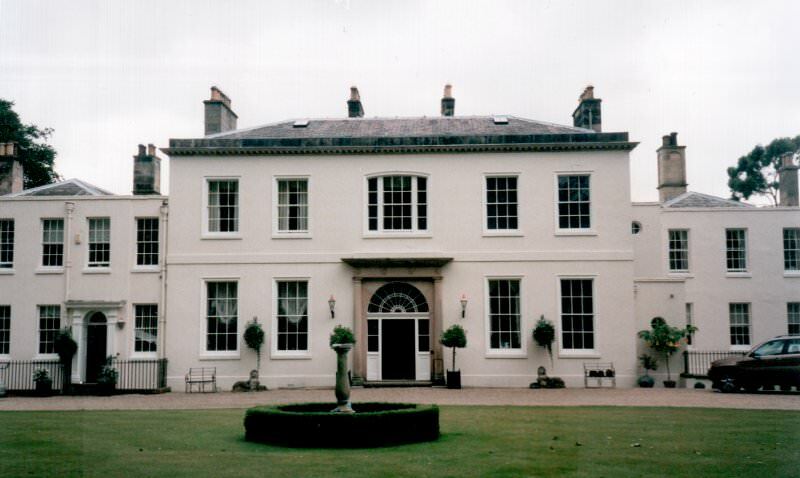 Since I started the journey into the history of the Thrale family name I have read a fair bit about Hester and Henry Thrale, their wealth and homes, but I was shocked by the size of Brynbella, which has been well cared for by the current occupants - the Newman family. What made it even more surprising was that when was built by Hester, when was writing of having much less income at her disposal than she did during the height of her wealth with Henry Thrale from brewery income. On the way out of Tremeirchion we passed Bach-y-Graig house. This 16th century building was now being operated as a bed and breakfast hotel. It was apparently the first brick built building in the area. Previously all the buildings were built from local stone. The bricks were brought up by boat on the river Clwyd. Sheila earlier had told me that the building was in the Salusbury family and hence was left to Hester. I took a couple of distant photos, but time prevented us from closer inspection. Perhaps I will return one day and stay there? 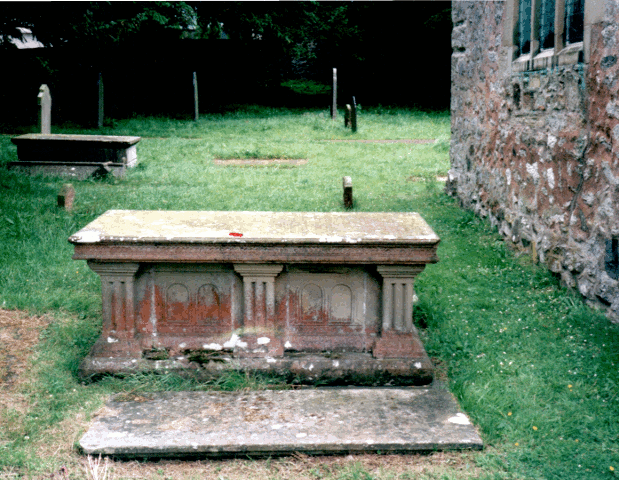 We set off this morning to North Wales to visit Tremeirchion that Hester Thrale later returned to, and died in. North Wales is green beyond anything I have seen - even more so than Scotland. I think the main difference is the lochs in Scotland. You can probably tell that I was born and brought up in London. The winding roads, valleys and village life appears to be the stuff that romantic novels are made of. After five hours and 150 miles I thought this had better be worth it. We passed Bachygraig which is now a B&B and drove up to the Welsh chapel and church in the village and the very imposing and substantial mansion built by Hester - Brynbella. After speaking to one of the workmen there we were advised that there was no one at home. David was allowed the privilege of taking photos. The village church was nothing very special, just your typical village church. We met some very amenable and hospitable villagers who were more than happy to help in our research of the infamous Mrs Thrale. The brief encounter that I had with village life, I can honestly say that it is a world away from what I am used to in the city. Everyone really does know everyone and the pace of life is much more relaxed and the quality of life is no comparison to that of a busy working mother of three children in London! Ethan was much better this morning, however I really want to take him home now as he is unwell. Fortunately we are going home tomorrow. I have enjoyed this holiday but it is still nice to get back home. It is raining heavily so we are heading for Folly Farm. There is an in door fun fair, play area, pet stroking, feeding area. We were all impressed with the facilities that this farm offered. I can't add much that Michelle hasn't already done. We arrived late at Folly Farm and only had three hours before it closed. It was good despite the very heavy rain and this compounded the non-availability of many animals due to the current outbreak of foot-and-mouth disease. The fact that we still had a good time despite these problems was surprising, as was the inexpensive cost of entrance. Most of the evening is spent packing. Last day. We have to be out by 9.30am. We manage to achieve this - just. A final, but long, swim in the on-site swimming and spa pool and we leave for the long drive home at a about 12.30. All-in-all a good holiday. Plenty of relaxation, mediocre weather, good accommodation and all the family got something out of it. Natasha was upset that we didn't find time for me to teach her to skip, as I promised. I'll have to make up for this at home next week. While searching for an address of Brynbella I came upon Thrale.com. I read with great enthusiasm about your travels to Tremeirchion and Brynbella. Although I have not been to Tremeirchion Village I have driven by Brynbella. Please allow me to explain in hopes that you may somehow assist me. My distant Clough ancestor was John Clough who came to New England in 1635 without leaving a hint of his heritage. To make a long story short, we found by way of DNA analyses through Oxford Ancestors Ltd. (the company created by Dr. Bryan Sykes of Oxford University) that we are genetically linked to the Sir Richard Clough family of Denbigh. Hester Thrale was a descendant of Sir Richard Clough. I have been to Plas Clough, which Sir Richard Clough built after marrying Kathryn Tudor of Berain, and I have stayed at Bach y Graig, just down the road from Brynbella. In October 2001 I led a group of Clough descendants to parts of England and Wales that pertain to Cloughs in general. Of course I brought them by Plas Clough, Bach y Graig, and Brynbella. They were all very excited about seeing these homes! In September of this year I will be leading another group of Clough descendants to England and Wales. Since I know the owners of Plas Clough and Bach y Graig I have been working out details to have my group see these former homes of Sir Richard Clough. However, I am writing to you today in hopes that you can assist me with the address of the current owners of Brynbella in the hopes that they might allow us access to the grounds. All I know is that Brynbella is currently owned by Peter Neumark. Not being a Wales native I do not know what the address is. Can you help me with this? Also, might you know the address for Berain and who the current owners are?